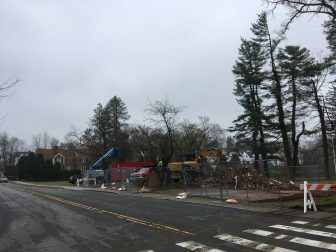 The demolition of the “Mead Park Brick Barn,” which came nearly one year after the first selectman broke a tie on the Town Council to have it razed, clears the way for New Canaan to pursue a plan for the area that Keith Simpson Associates put forward several years ago. 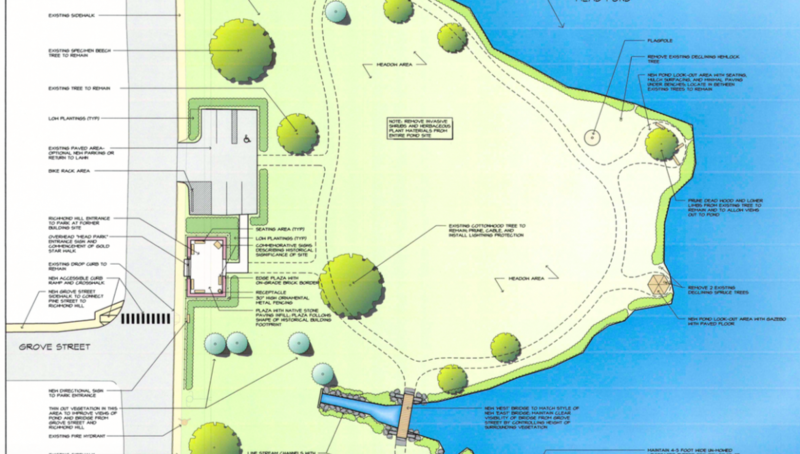 Plans call for an overhead sign announcing the new formal entrance to ‘Mead Park’ and commencement of the “Gold Star Walk,” an honorary walk in memory of New Canaanites who died in World War II that rings that side of Mead Pond. The footprint of the Brick Barn would remain as a plaza with native stone paving infill and seating that’s edged by ornamental fencing, an on-grade brick border and low plantings, under the Simpson plan, and a pedestrian path would run off of the back toward the Gold Star Walk itself. The small parking area next to the razed building would include six parking spaces, one for disabled drivers, and a bike rack would be added there, under the plan. It isn’t clear just now whether every detail of the Simpson plan can be realized immediately, Mann said—for example, the plan include a commemorative sign as well as several benches in the plaza that typically cost the town about $4,000 apiece. However, the plan will serve as a guide in remaking the area. 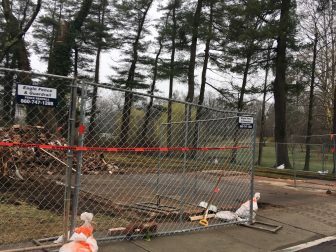 The Town Council last May approved $65,000 in bonding as part of a larger package, for the “demolition and restoration of the grounds at the Mead Park Richmond Hill Storage Building.” Last month, the Board of Selectmen by a 2-1 vote approved about $53,000 in contracts for the demolition piece, leaving about $12,000 for the restoration work. Much of that money is to be used for topsoil and seed for disturbed areas around the former Barn and then will go toward plantings to delineate what the Simpson plan calls the “plaza,” Mann said. “I would love to edge the plaza on grade with a brick border, I don’t know about the paving infill,” he said. The northern edge of Mead Park is poised to see more pedestrian activity, especially as the town has extended sidewalks from Grove Streets and the intersection of Richmond Hill Road and Park Street, and planned another extension up Richmond Hill to Marshall Ridge Road. Perhaps these funds would best be spent repaving our roads? 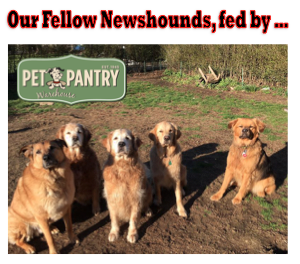 Or for services for those in need? The memorial would be lovely, but could be much more simple. any chance you can make illustration bigger so we can read text that goes with KSA work? George I’ve now embedded the plan as a PDF at the bottom of the story, you should be able to zoom in. Do we really need an asphalt parking lot, especially for six cars? Why not just a lovely vista of nature – grass, shrubs, trees, with a couple of benches? I agree. With apologies to Joni Mitchell, why pave paradise and put up a parking lot? I supported demo of the eyesore old brick barn to open up views of Mead Park, as did others. Now, a “plan” for a gateway/new entrance magically appears. Appears that “the powers that be” did not want discurrsion of the “plan,” while the debate re demolition was in process. Certainly feels like typical behavior in Hartford and Washington has made itsw way to New Canaan.